IMAGE: 2:30 p.m. in Mexico City…. time for a snack! All photos by Nicola Twilley, unless labelled otherwise. 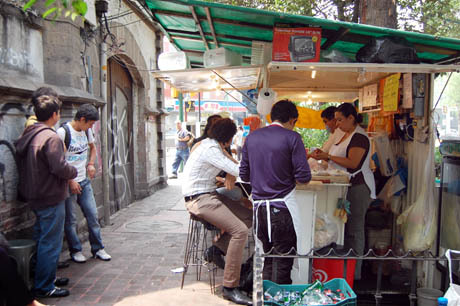 Mexico City’s streets are dense with food vendors. 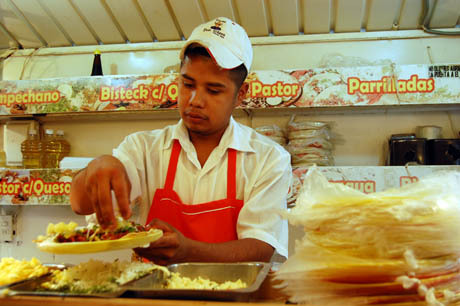 Statistics are hard to come by, since the industry is largely unregulated, but in her 2007 Survey of Street Foods in Mexico City, anthropologist Janet Long quotes a survey by Reforma newspaper that found 560,000 street vendors in the city proper — an astonishing one vendor for every 8.5 chilangos. The sidewalk is a chilango’s pit stop, his permanent picnic. He likes to eat standing up, the aroma of sizzling meat mingling with those of exhaust fumes, putrefying garbage, dust, and sweat. But for a Spanish-challenged gringo (such as myself), it can be hard to know where to start. 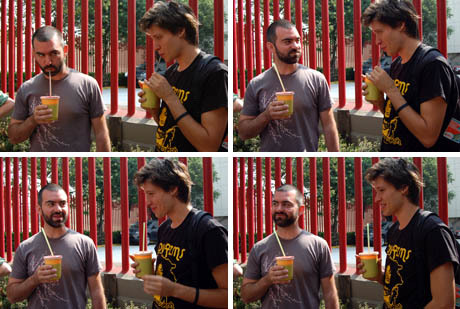 IMAGE: Wayne and Tally enjoy an El Vampiro juice each. Fortunately, several Postopoleros (including my fellow bloggers Jace Clayton and Wayne Marshall) were lucky enough to be the guinea pigs for an amazing three-hour street food tour and tasting by a new outfit, Eat Mexico. 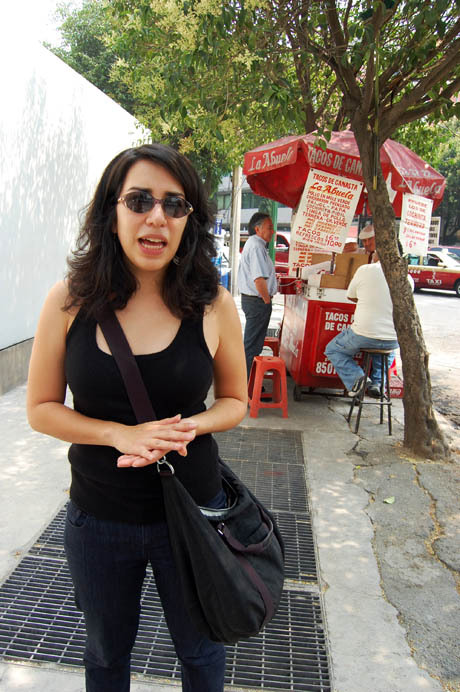 Under the expert guidance of Mexico City native Jesica López Sol and American expat Lesley Téllez, we slowly ate our way around the triangle of streets named after rivers between James Sullivan and Paseo de la Reforma in the Cuauhtémoc section of the city. 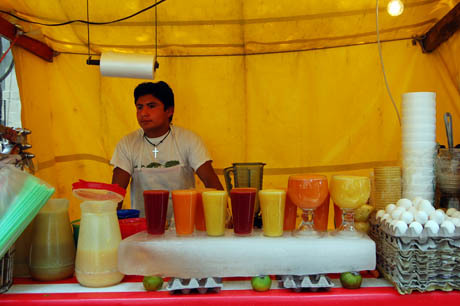 IMAGE: The El Vampiro juice includes beets, carrots, and parsley (photo by Wayne). 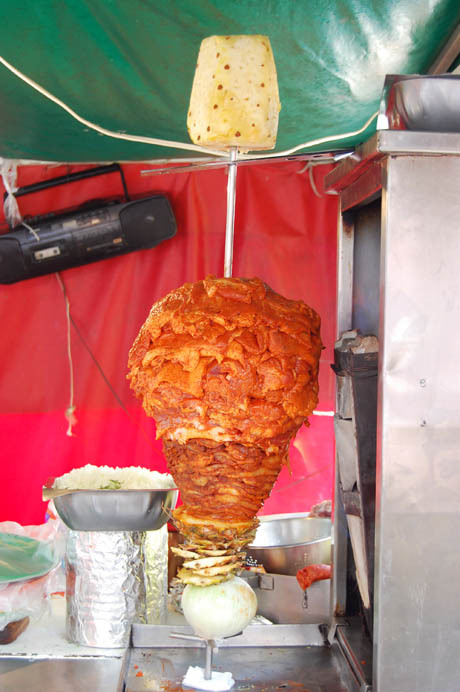 Mexico City has no indigenous cuisine, but if there is such a thing as a municipal dish, it would have to be tacos al pastor. A variation on Middle Eastern shawarma, it is made from pork, marinated with various spices, including garlic and a heavy dose of annatto, which gives it a shrill orange color. The slices of pork are mounted atop each other to form a huge orb, and impaled on a metal stick, which revolves around a vertical charcoal grill. 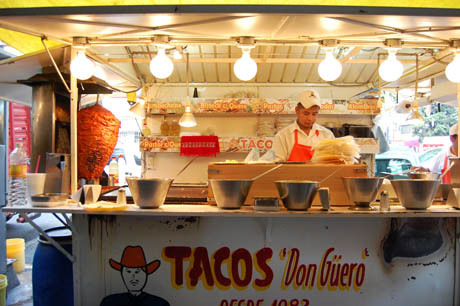 The exact ingredients in each taco stand’s marinade are a closely guarded secret, but various internet sources seem to suggest Coca-Cola is often involved, as well as the more standard vinegar, chiles, and orange juice. IMAGE: “Con verduras,” i.e. served with onions and coriander (cilantro). IMAGE: Pineapple juices drip down onto the pork as it cooks, tenderising and caramelising simultaneously. Lesley and Jesica were fantastic hosts, armed with a chopping board and knife in order to divide each burrito, quesadilla, tamal, and taco into sample sizes, as well as a wealth of information about the ingredients, preparation, and cultural background of each food type on our tour. IMAGE: Jesica introduces our tamal. The street food menu has its own temporal rhythm, just as a restaurant would serve different foods at different times of day. We were lucky to find any atole or tamales left at noon, as the corn-based thin porridge-y drink and the steamed, stuffed corn-dough snack are a traditional breakfast combo. Later in the evening, Jesica and Lesley told us, tamales make a comeback, alongside camotes (boiled sweet potatoes) and elotes (corn-on-the-cob, served sprinkled with chile powder and grated cheese). IMAGE: Lesley prepares us for tacos de canasta. IMAGE: Jesica even brought along a handy chopping board and knife. Among the many foods we tried were some that I didn’t even know existed. 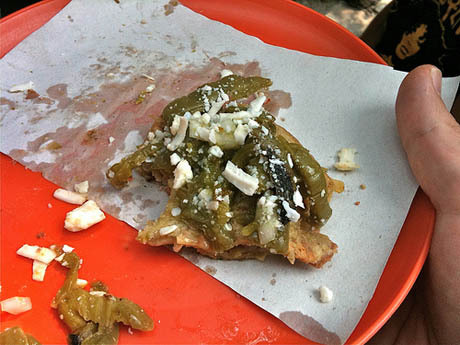 My new favourite, the tlacoyo, is a long torpedo-shaped cornmeal pancake stuffed with beans and cheese, and in the case of the one we sampled, topped with nopales (cactus leaves) and more cheese. Later, I went back for a blue cornmeal tlacoyo, topped just with salsa. It was possibly even better. IMAGE: Jesica purchases a tlacoyo, made to her exact specifications. IMAGE: Tlacoya with nopales (photo by Wayne). Tacos de canasta (or tacos sudados) are so-called because they are sold from a cloth-covered basket where they sit on top of each other, sweating. We tried one filled with cochinita pibil, a slow-cooked pork stew, and together the soft taco and tender meat formed a somewhat baby-food-like, yet delicious, mush. 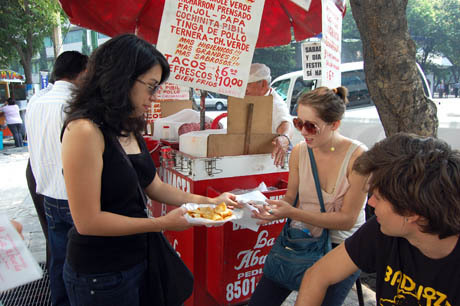 IMAGE: Leslie distributes our cochinita pibil taco de canasta. I must admit to being a little bit full by this point on the tour, and hence unsure whether I really needed even a small serving of pork fried in its own fat. 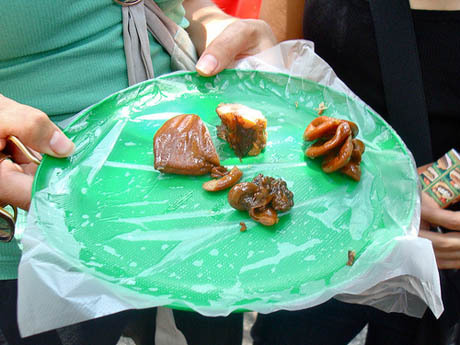 However, Jesica invited us to sample chunks of pig skin, snout, lung, and nana, or uterus, with such charming enthusiasm, it seemed churlish to refuse. IMAGE: Carnitas anatomy class: throat, snout (I think), skin, and uterus (the large fusilli-ish shape on the right) (photo by Wayne). IMAGE: Tally tries the nana. There is nothing wrong with maciza — you may actually prefer maciza — but as when standing in line at a famous gelatería only to order vanilla, one is occasionally under the impression that there is something less than manly about the decision, that one has declined to consider the possibilities. And of course, as it turns out, the nana really is delicious – rich and firm like a filet mignon, and not at all rubbery or iron-flavoured, which were my main fears. I felt as though I had finally earned my stripes as a genuine food blogger! 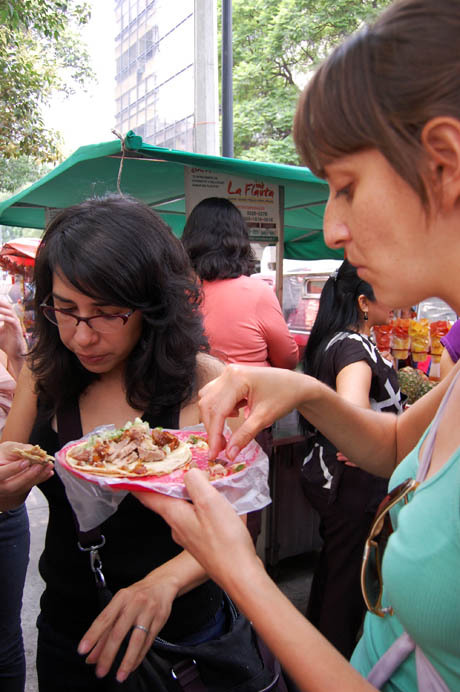 IMAGE: At the end of the tour, Lesley and Jesica treat themselves to a well-deserved taco de carnitas. 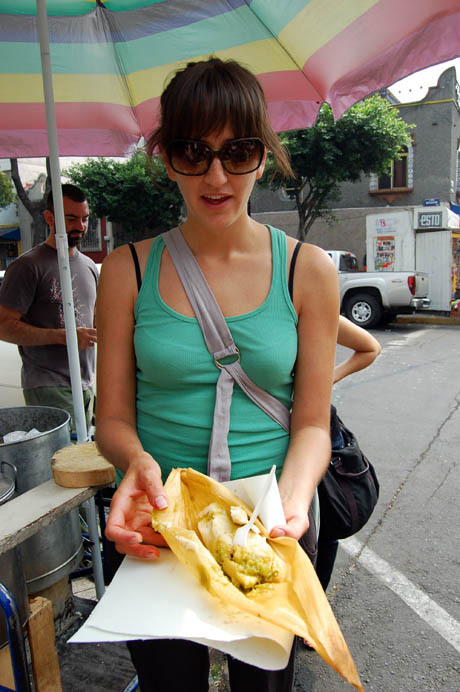 As Janet Long notes in her Survey, the food sold on the streets of D.F. is for the most part traditional Mexican cuisine: “the same basic diet based on maize, beans, squash, and chile peppers that they have been eating for well over 5,000 years.” Burgers and hot dogs are available, but seem much less popular. 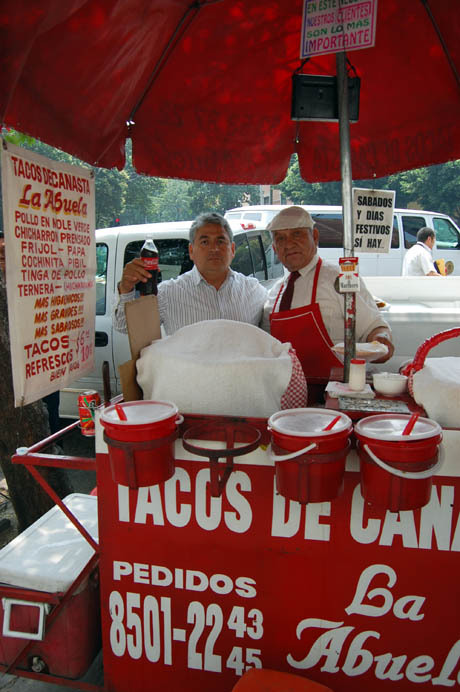 Long before the Spanish conquistadors arrived in the early sixteenth century, Aztec food vendors were setting up their stands near the Tlatelolco Market in the city, then known as Tenochtitlan, or along the canals that served as roads in the ancient city. They sold fully cooked dishes of insects, fish, and meat stews to the 60,000 people said to congregate at the great market every day. Today, each taco stands offers a similar range of salsas for those looking for what David Lida terms, “the exquisite sensation of enchilarse – to be overwhelmed by chile.” In my greedy haste, I kept eating my samples before remembering to add any salsa, although as these prepared sauces have been identified as the most likely hosts of bacterial contamination, perhaps that was not such a bad thing. 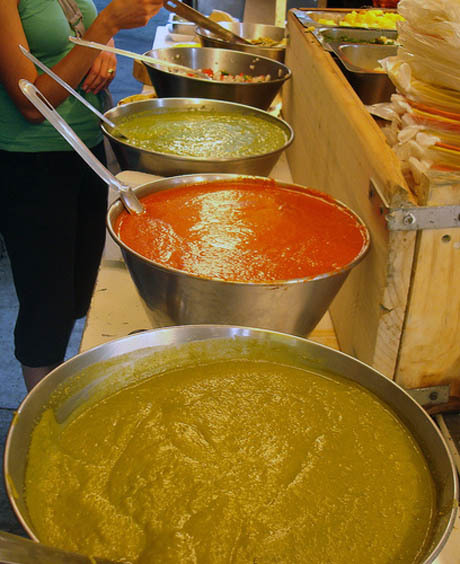 IMAGE: Big buckets of serve-yourself salsas for tacos (photo by Wayne). 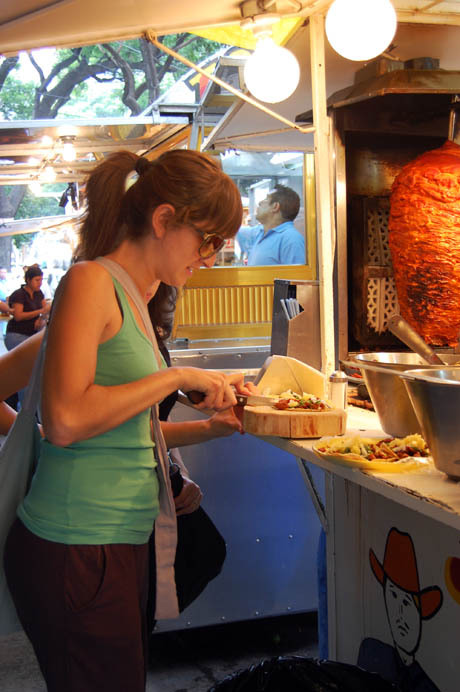 Although Mexico City has always had a tradition of street food, as well as a climate that permits year-round outdoor life, Janet Long’s statistics show that the number of vendors has more-or-less tripled in the past decade. The reasons behind that expansion reveal a fascinating blend of socio-economic, political, and infrastructural forces that shape the D.F.’s landscape of mobile dining. One factor behind the boom in street food vendors is the sprawling growth of the city itself, and its resulting nightmarish traffic. As Long explains, the city’s size and gridlock “force people to travel greater distances to their place of work or study, and make it impossible for them to return home for the mid-day meal, which is traditionally the most important meal of the day in Mexico.” Meanwhile, some recent urban arrivals “must resort to living in single rooms, without cooking facilities,” making them a captive market for taco stands and tamal vendors. Of every ten jobs created in 2005, six were in the informal sector. […] The formal sector of the economy cannot provide enough jobs to employ a majority of the population. […] Unemployed workers are basically provided with two options: 1) attempt to cross the border into the United States and find work as an illegal worker or, 2) look for work in the informal sector. 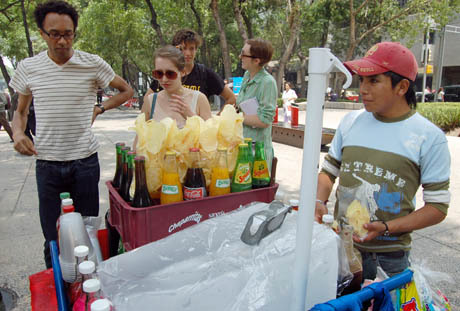 In other words, street vending serves “as an escape valve to relieve the social and economic pressures created by unemployment.” With a bare minimum of capital investment, would-be workers can sell food to both support themselves and provide a source of cheap food for their fellow low-income chilangos. IMAGE: Tacos de canasta “La Abuela” — I particularly enjoy how the Coca-Cola can and bottle are incorporated into the aesthetic. Since I arrived in 1990, street vendors have been a problem, and each successive mayor has announced plans to do away with them. […] Still, tacitly, they have been tolerated. In a city where there isn’t enough work to go around, few politicians are willing to take measures that would separate people from their jobs. So, although health regulations and vendor permit requirements exist, Mexico City’s government concludes — probably correctly — that they would be impossible to enforce, and therefore, they are universally ignored. In other words, our tacos were an edible symptom of economic desperation, political impotence, and a city stretched beyond its infrastructural capacity. 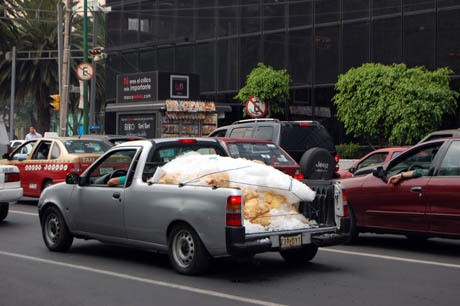 IMAGE: A pick-up truck full of chicken parts. Speaking of infrastructure, having just spent the morning at the Central de Abasto wholesale market, it was interesting to see the mountains of fresh produce, blocks of ice, and bags of chicken parts redistributed around the city to thousands of smaller scale vendors. 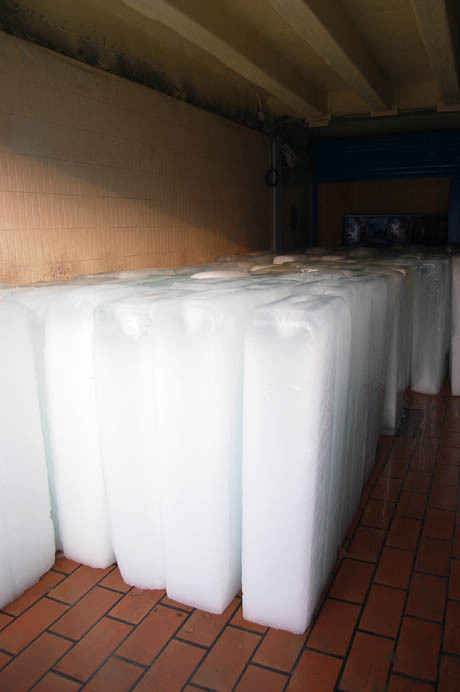 IMAGE: Blocks of ice sold wholesale at the Central de Abasto market. 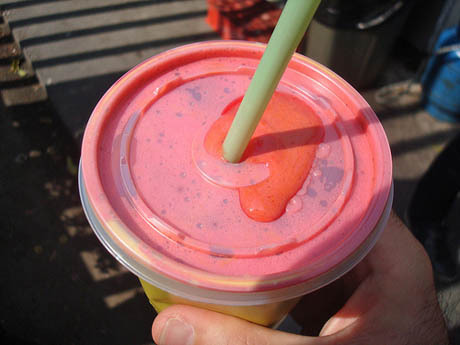 IMAGE: Ice block re-sized to serve as a smoothie display stand. IMAGE: Smaller cart-mounted ice block, complete with ice shaver to make raspados. If supply is one aspect of the behind-the-scenes geography of street food vending, storage is another. At Foodprint NYC, for example, I was intrigued to hear panelist Sean Basinski explain that New York’s food trucks have to be taken to a Department of Health-approved garage every night, for storage and cleaning. 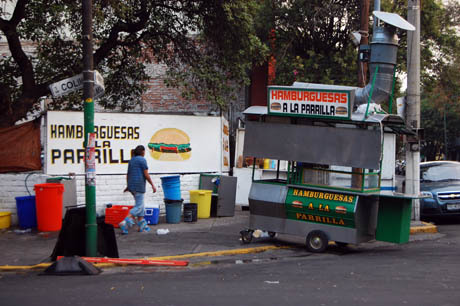 IMAGE: Cleaning up a hamburguesa truck at the end of service. 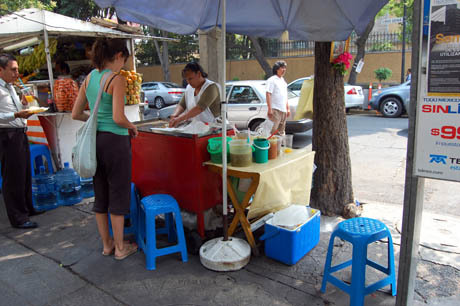 The ubiquitous taco stands and baskets of tamales occupying their three-foot median along Mexico City’s traffic-clogged streets are thus a kind of distributed domesticity and an ad hoc network of unofficially-subsidised street cafeterias, as well as a tourist dining destination. [NOTE: This post is part of a series of reports from my time in Mexico City as part of Postopolis! DF, which was presented by Storefront for Art and Architecture from June 8 to June 12, 2010. This entry was posted in Day Out, Postopolis! DF, Uncategorized. Bookmark the permalink. Trackbacks are closed, but you can post a comment. it tastes better if done with “Bolillo” instead of a french baguette. I spent my childhood here and have not been here in a very long time. This post has taken me back a bit, very enjoyable. Thanks! As for concerns about the food safety, I’m afraid Americans are too obsessed with cleanliness and germs. Some of which, I’m embarrassed to admit, has rubbed off on me. I remember I used to eat most of this street food as a kid and aside from occasional stomach problems, I was perfectly fine. I think, in fact, eating this food has made my body more resistant to spices and other things not easily found in American cuisine. Furthermore, I’d take real sugar and organic produce over high fructose corn syrup and genetically-engineered everything. I shall check the rest of the articles on this beautiful city. i am looking for a french baguette filled with black beans and melted cheese. did you see or have one in Mexico City? what was its name? Eating pig uterus?! This is taking the concept of “waste no part of an animal” to new heights! I like it. Why waste anything edible. Thanks for the great tour and photos. I prefer the same food, but in Los Angeles. It will never tast the same, and the variety is still lacking. In my family, we say the street dirt and typhoid is part of the flavor 🙂 I’ve never had home-prepared esquites as tasty as the ones I buy in the street. I’ve never had typhoid, either, but I don’t eat in any stand. The Mexican versions of hamburgers and hot dogs are also really tasty. My favorites are hamburguesas al carbón, with a lot of chile verde and pineapple. By the way, I’m chilanga and I’ve never had a nana taco. Unfortuntely, I suffer from the character flaw you mention: I always order maciza. there’s one thing i’d have to disagree with though. david lida writes that there exists no “indigenous chilango cuisine”. i think there actually is: in the late 19th/early 20th century restaurants like el prendes or bellinghausen championed it. 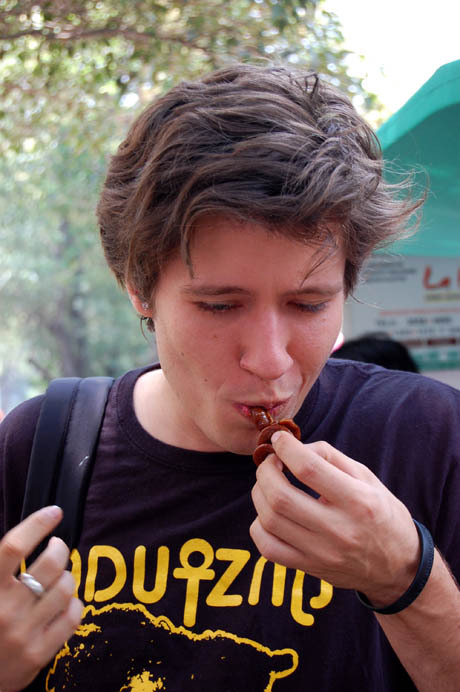 it was a result of the confluence of spanish, french, prehispanic cooking techniques –confit, puchero, comal roasting for example– and ingredients from all over such as gusanos de maguey & escamoles (ant larvae), langostinos/acamayas/crayfish, pork, beef. yes, it’s mestizo cuisine but one that’s also unmistakeably chilango. el prendes disappeared some years ago but its influence lives on. mr lida is of course right in that “if there’s a municipal dish, it would have to be tacos al pastor”. but we should also consider: chilango tortas, which are not the same as poblano or toluqueño tortas –whenever you’re in mexico city try the tortas de pavo at la casa del pavo or the tortas de adobo next door at lonchería la rambla–; tacos de suadero (cut from the brisket of beef) cooked in pork lard –confit de suadero, probably?– and tacos de cochinada, a misterious mix of chicharrón, bistec, and the greasy remains of suadero “confit”. now, that’s chilango. I wish I was lunching with you! And now, after having read your very detailed lunch post, we shall go have tacos al pastor for lunch! Although it would be nice to find some tlacoyo. That reminds me: I should have mentioned that neither I nor my fellow street food explorers suffered any ill-effects from our tour (other than being a little full and sleepy that afternoon)! Main concern about Mexico, it looks tempting but they don´t have the regulations of Health Department as we have here. You know what I mean. I prefer the same food, but in Los Angeles.